100 Meters from the Beach! NOW READY! Las Olas de Bavaro is the newest development in the neighborhood of Los Corales in Bavaro Beach, Punta Cana. 100 meters from the white sand, turquoise colored beaches. Bavaro-Punta Cana is located on the East coast of the Dominican Republic, where you can find the most beautiful beaches of the Caribbean, home to Las Olas de Bavaro. In addition, world known golf courses are located less than 3 km away along with the best shopping malll in the area – Palma Real Shopping Village. Only 15 minutes from the Punta Cana International Airport and 1 hour from La Romana International Airport. 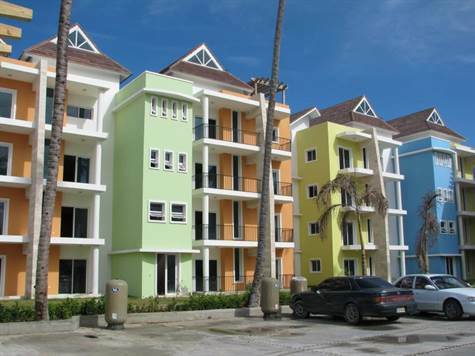 Las Olas Bavaro is composes of 6 residential buildings of 4-levels for a total of 36 apartments – 1, 2 and 3 bedrooms, with Penthouse units in two of the buildings. Elevators in all the buildings. PRICE, AVAILABILITY AND BUYING CONDITIONS MAY CHANGE WITHOUT NOTICE.